Columbus may have outfoxed the Spanish court and his rivals, but he is falling victim to the court of political correctness. The explorer who discovered America has become controversial because the very idea of America has become controversial. In California, Columbus Day became Indigenous People's Day, which sounds like a Marxist terrorist group's holiday. While it's tempting to put that down to California political correctness, in South Dakota it was renamed Native American Day. The shift from celebrating Columbus' arrival in America to commemorating it as an American Nakba by focusing on the Indians, rather than the Americans, is a profound form of historical revisionism that hacks away at the origins of this country. About the only thing sillier than a group of people emphasizing their collective identity as a Spanish speaking people, and denouncing Columbus as an imperialist exploiter is Ward Churchill, a fake Indian, who compared Columbus to Heinrich Himmler. Ward Churchill's scholarship consists of comparing Americans in past history and current events to random Nazis. If he hasn't yet compared Amerigo Vespucci or Daniel Boone to Ernst Röhm; it's only a matter of time. Columbus was far more benevolent to the indigenous population than, say, Abraham Lincoln, or Ulysses Grant, or General Sherman. God vindicated Columbus in the hurricane that killed Bobadilla, yet saved the gold that was owed to him. Really? Cesar Chavez a thug? I 99% agree with you Daniel but seriously . . . The Columbus Dispatch of Columbus City distances itself from... Columbus. To be politically correct means you have to be proud of being ashamed. Great post. I would love to come to a La Raza rally against Columbus and start chanting "We are the locals. No to Spanish, no to Hispanics, no to Jesus". "This is how it begins. And that is how it ends. Nations are not destroyed by atomic bombs or economic catastrophes; they are lost when they lose any reason to go on living. When they no longer have enough pride to go on fighting to survive." One could also say this about Britain, France, and other Western nations that are being swamped with Muslim immigrants at those countries' invitation, and being lorded over by the parasitical minions of the European Union. "The battles being fought over Columbus Day foreshadow the battles to be fought over the Fourth of July." The battle against US Independence day started long ago in this country, even before the Columbus Day fight. It is why it is more widely known by the date. How many other holidays are called the date in which it falls on? We don't call Christmas, The 25th of December. We don't refer to New Years as the Eve of January First. The liberals successfully already pulled the Independence out of Independence day by capitalizing on American laziness. Anonymous, you are partly right, Cesar Chavez was not a thug, he was a butcher, a murderer. He murdered anyone who opposed him, and some that simply were in the wrong place at the wrong time. Daniel, this is an especially timely post for me. I’ve come to the conclusion that we only have two choices, speak out and risk being vilified and/or destroyed or cower into place where our souls are destroyed along with our bodies. Is this not the very same defining moment that our forefathers came to and, historically speaking, though they did not fair well themselves, they can be credited with birthing something that was exceptional by any standards. Today is Columbus Day and in honor of the divine and historical process that granted us this blessed nation, I throw in my voice to call out evil and stand because I’d rather lose my life and keep my soul than the other way around. the white man was in north america, as it became known, before anybody else,at the end of the last ice age. look it up if interested. And more and more people are celebrating the winter solstice rather than Thanksgiving, Hanukkah, or Christmas. The rotation of the Earth is a fact of life. It affected the currents which a sail powered ship had to sail on. Switch the rotation and maybe the so-called exploited would have been the exploiters. It is actually more than likely. The so called exploited peoples warred among themselves and destroyed each other. It is the human not the imperialist condition. Given the chance to go across the seas and plunder they would have. Certainly the Mongols did and after Tamerlane they did it as poor exploited Moslems. The Leftist diatribe is against the United States. Once the US is out of the way and Europe is back on top we won't be worrying about exploited peoples any more. It is all just a sales tactic. A bait and switch,. How about the Vikings? There on the North American continent well before Columbus and left stone buildings in provincial Canada & Northern Maine (possibly elsewhere). 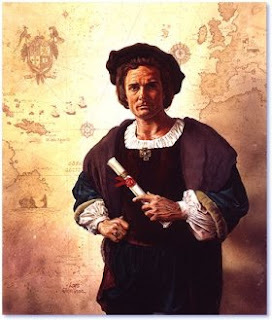 Columbus was following a map & discovered nothing really. Well i don't think that its possible to get rid of certain people and continue to have the same country. I think if one gets rid of white peope in America then the name "America" will be changed as well, because it represents former white colonists, who will probably be hated by the new population. The US constitution will also be removed since it was created by white people only and does not represent other people's views or interests. There will be crackdown on the english language as well because this is the language of the former white colonists. So i think that most signs and symbols showing that USA was once a white country or that it was founded by europeans will be removed, since they will undermine the new non-white authority - they represent a theoretical claim to the land. History will be rewritten as well. Italians are the 4rth largest community in the USA with nearly 20 million citizens of Italian descent. Time for them to rally on Columbus Day. Eureka! I have the solution to two problems: Change the holiday to "Redskins" day and change the name of the Redskins team to Washington Christopher Columbus. This will of course anger all the pseudo-native Americans out there who need something to be angry about but it will Bob Costas happy. I don't understand. Most Mexicans are of European or partial European descent. There are very few natively indigenous Mexicans any more. BTW I wonder what they say in Uruguay which is 95% white European? I remember hearing back in the 1950's that the name, "Mexican" was derived from the word Mix...because of the Spanish/Indian mixture. I wonder if there is any truth to that. The Post Office, who is financially in the red year after year continues to give all its workers today-Columbus Day, off as a paid holiday. Just think the money they would save if they didn't....no one should be getting Columbus Day off imo...not that I have anything against Columbus but its a bunk " Federal Holiday" esp. in these financial times. My question to the supporters of anti-America is always the same. What proof do you have that your idea of transforming it into whatever it is you feel is better will actually make it better? For those who call us imperalist, land-stealing murderers, should we turn over everything to the Native Americans and let them be our sole rulers hoping they will be benevolent to us? What if they weren't? Or how about the Communist/Socialist/Facists who demand an end to capitalism, the free markets and liberty? Would they admit to the proven historical facts that these "isms" have always led to mass murder, extreme poverty for those outside the chosen few, and done nothing to make people's lives better? History cannot be rewritten although those on the left attempt to revise it of anything that doesn't comport to whichever leftwing ideology they subscribe to. Wouldn't it make a better today and a better future if all worked together to promote the things that history has proven to benefit people? Anonymous said: "I don't think that its possible to get rid of certain people and continue to have the same country." Don't you realize that is exactly the goal of all of the myriad of radical leftist's ideologies? Each want the country to be transformed into what they want. None want to the continue to have the same country. It is true that all are united in hatred of the white man, especially the leftist white man and woman; but elimination of the white race is secondary to reaching their goal of first exterminating the institutions that exist within America and that made America unique in all of human history and the principles and values of the Jewish and Christian religions which were instrumental in the founding of America. You write: "Had the Aztecs, the Mayans or the Iroquois Confederation developed the necessary technology and skills to cross the Atlantic and begin colonizing Europe, the fate of its native inhabitants would have been far uglier." I have always maintained that Christianity is the best thing that ever happened to the peoples of the Western Hemisphere. It ended a number of obscenely cruel "civilizations" and replaced them with one that, while imperfect, was a great deal better. And I am a practicing Jew married to a man of Cherokee-Choktaw ancestry, so I surely am objective in this matter. In 1492 Columbus sailed the ocean blue ... in 1487 to reconsecrate the Great Pyramid of Tenochtitlan, wiki say, the Aztecs reported that they sacrificed 80,400 prisoners over the course of four days. And Mr. Stafford's correct about Europeans being First First Nations. Kevin Stafford is correct in his comment. Check out Kennwick Man. Anyone else heard about the Sukkot miracle and Colon? Colon was Jewish and his arrival coincided with Sukkot that year; as they approached the coastline the four species floated near his ship and he and other Jews on board took solace in the wonder of what occurred. "A nation's mythology, its paragons and heroes, its founding legends and great deeds, are its soul. To replace them with another culture's perspective on its history is to kill that soul." "In California, Columbus Day became Indigenous People's Day,..."
My comment: Not the entire state, but yes in Berkeley. "They can just rename it Caesar Chavez and still give them the day off..."
My comment: Cesar Chavez Day is ALREADY a holiday in the State of California. Daniel, I've heard you make this claim about Rush Limbaugh before, could you (or a reader) please enlighten me as to his ancestry - I thought he was German American and I'm interested to know. Thanks. Limbaughs Mother is of Scotch descent while his father is of German descent.